Platetectonics is the process of continents on the Earth drifting and colliding,rock grinding and scraping, mountain ranges being formed, and earthquakestearing land apart. It makes our world dynamic and ever-changing. But should itfactor into our search for life elsewhere in the universe? TilmanSpohn believes so. As director of the German Space Research Centre Institute ofPlanetary Research, and chairman of ESA?s scientific advisory committee, hestudies worlds beyond our Earth. When looking into the relationship between habitabilityand plate tectonics, some fascinating possibilities emerged. Itis thought that the best places to search for life in the universe are onplanets situated in ?habitable zones? around other stars. These are orbitalpaths where the temperature is suitable for liquid water; not so close to thestar that it boils away, and not so far that it freezes. Spohn believes thatthis view may be outdated. He elaborates, ?you could have habitats outsidethose, for instance in the oceans beneath ice covers on the Galileansatellites, likeEuropa. But not every icy satellite would be habitable. Take Ganymede,where the ocean is trapped between two layers of ice. You are missing a freshsupply of nutrition and energy.? Soplanets and moons that lie beyond habitable zones could host life, so long asthe habitat, such as an ocean, is not isolated. It needs access to the keyingredients of life, including hydrogen, oxygen, nitrogen, phosphorous andsulphur. These elements support the basic chemistry of life as we know it, andthe material, Spohn argues, must be regularly replenished. Nature?s method ofachieving this on the Earth appears to be plate tectonics. Plate tectonics - essential for life? Itis an idea growing in popularity among planetary scientists. Says Spohn, ?platetectonics replenishes the nutrition that primitive life could live on. Imaginea top surface that is depleted of the nutrition needed for bacterial life. Itneeds to be replenished, and plate tectonics is a method of achieving this.? Spohn found that the further he delved into the issue, the moreimportant plate tectonics seemed to be for life. For example, it is believedthat life developed by moving from the ocean to the kind of strong and stablerock formations that are the result of tectonic action. Plate tectonics is alsoinvolved in the generation of a magnetic field by convection of Earth?spartially molten core. This magnetic field protects life on Earth by deflectingthe solar wind. ?Not only would an unimpeded solar wind erode our planet?satmosphere, but it also carries highly energetic particles that could damageDNA. Anotherfactor is the recyclingof carbon, which is needed to stabilize the temperature here on Earth.Spohn explains, ?plate tectonics is known to recycle carbon that is washed outof the atmosphere and digested by bacteria in the soil into the interior of theplanet from where it can be outcast through volcanic activity. Now, if you havea planet without plate tectonics, you may have parts of this cycle, but it isbroken because you do not have the recycling link.? Ithas also been speculated that the lack of tectonic action on Venus contributedto its runaway greenhouse effect, which resulted in the immense temperatures ithas today. Allthis evidence adds up to paint a convincing picture of many lifeforms onlysurviving on worlds where plate tectonics are active. For astrobiologists,there is another interesting element to this story. Many within the planetaryscience community believe that to have plate tectonics, the near-surface rockmust be weakened. The molecule most effective at doing this is H2O-- water. So worlds with plate tectonics are likely to have water as well,which means they feature two ingredients theoretically necessary for life. Thispresents an exciting option: searching for plate tectonics on distant worlds asa sign of life. Spohn agrees that this is a possibility, but remainslevel-headed. ?It?s an interesting idea, but is just speculation at themoment,? he explains. ?As a biosignatureit would be very difficult to detect, especially with current technology?. Theproblem is how challenging it is to spot plate tectonics from orbit even on ourown Earth. The jig-saw puzzle shape of continents along with the presence ofmountain belts provides indirect evidence. Mid-oceanic ridges are more convincing,but these are covered with water and not visible from space. 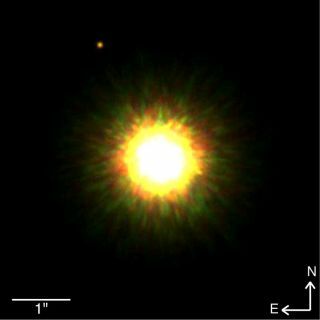 To see featureson an extrasolar planet would require a probe in orbit, and this is far beyondour technological ability. Even if we were able to achieve this, the evidencewould still be indirect. Currently there is no conclusive way of remotelydetermining tectonic action on a planet. Soperhaps using these markers as an indication of life on other worlds is a steptoo far, but as our technology becomes ever more complex it could become apossibility in the future. Imagine detecting an Earth-sized planet with anatmosphere, water, organic materials, and plate tectonics. It wouldunquestionably raise hopes for finding life in the universe.